The Eagles, they are good. Don’t forget to pace yourselves, Eagles fans: you’ve got two whole weeks to savor this one. The Eagles thrashed the Steelers, 34-3, Sunday afternoon in their first true test of the season. In all three phases of the game, the Eagles were the superior team. They faced a Steelers squad many believe are Super Bowl contenders, and for three hours they excelled at everything. Carson Wentz threw two touchdowns, again avoided throwing an interception, and looked every bit the part of a starting NFL quarterback. A good one. Maybe even a great one. It all began with a blocked field goal. Bennie Logan swatted a kick away on the Steelers’ first drive of the game, and Carson Wentz turned around and took the Eagles all the way down the field for three points. 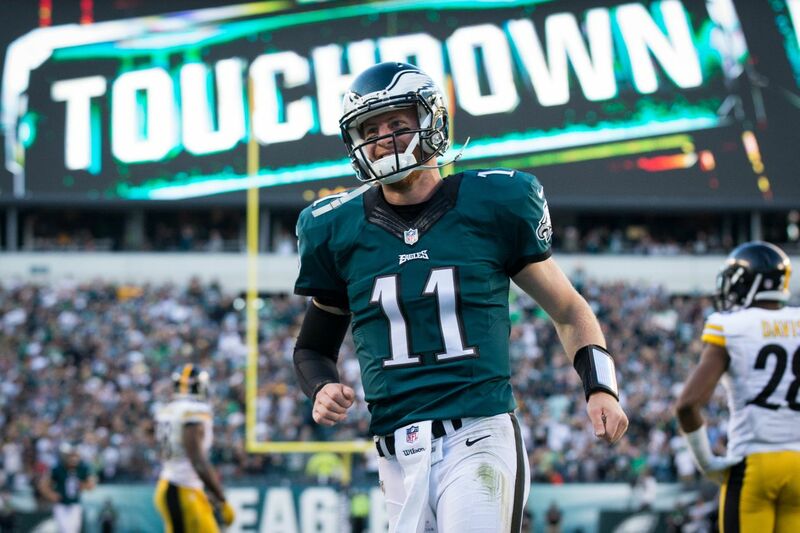 From there, Wentz and the Eagles improved with each drive, churning out 425 yards of offense and out-classing the Steelers’ defense time and again. Wentz finished 23 of 31 for 301 yards and two touchdowns. On the ground, Ryan Mathews ran the Ball twice for negative five yards and then never ran the ball again. He was struggling with an ankle injury during the week, but was expected to be okay to go today. Instead, Wendell Smallwood ran the ball 16 times for 78 yards and a touchdown and Kenjon Barner ran the ball eight times for 42 yards and a touchdown, splitting the duty almost evenly all afternoon long. The Steelers’ ground game didn’t have nearly that kind of success. Pittsburgh, which entered the game the sixth-ranked rushing team in the league, ran the ball nine times for 28 yards. DeAngelo Williams, who led the league in rushing yards entering Sunday, ran seven times for 20 yards and could never gain much traction. The Steelers got away from the run game when they realized they were going to need a serious comeback, of course, but the Eagles’ rush defense was very impressive when challenged. Writ large, there is not much more to say about this game. The Eagles were incredible. The Steelers looked bad. That was the story. Now it’s time to get ready. Because the Eagles look like they could be playing much longer this winter than we initially expected.